All placed you can edit text more complex than just a short phrase or number input, you see a text editor just like in Word. You can do all the usual things like making text bold, underline, add special characters, add links and images.The text editor also has a spell-check feature with many languages available. In the text editor you can insert citations from your reference list. Click the citation -icon, and a window pops up and lets you choose which reference to put in the citation for. The citation will keep the correct numbering if the references change order (e.g if references or sections are re-ordered). When you hover over the citation, you see the reference details. If you want to replace or delete a citation, you click it in editing mode. The text-editor has a track-changes feature like in Word. Since the content is not in one large document it works a little different. Turn the Track changes on in your editor to start the track change-function. You have to turn it on or off for each of the text boxes you are in. 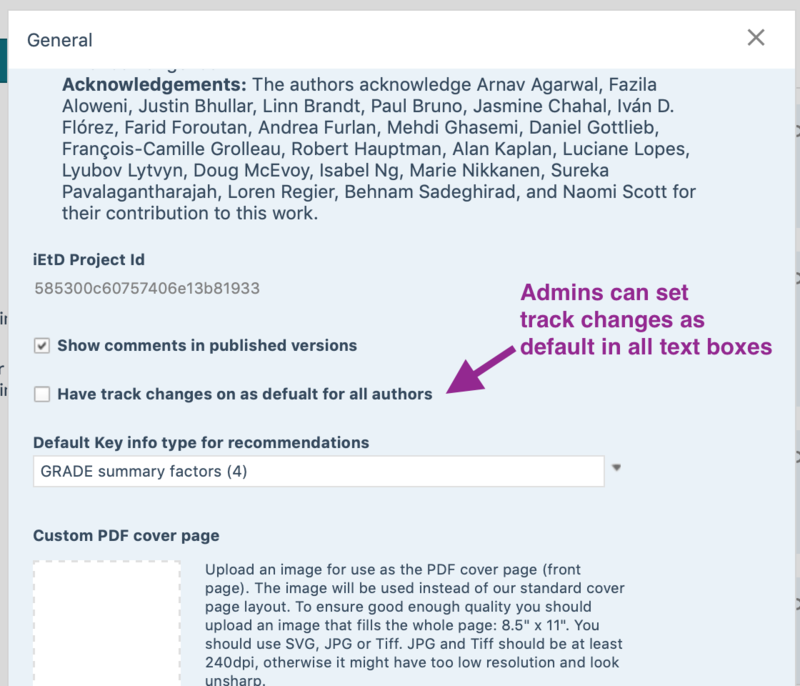 Admins of a guideline can set track changes to be on as default for all users. Tracked changes are visible when the text is in view-mode, with underlines of additions, and strike-through for deletes. Tp see who did the changes, or accept or decline you have to enter edit mode. If a PICO, Recommendation or Section has unresolved track changes, you see a 'Unresolved track changes'-icon in the top level of that item.